Below you’ll find a re-post of a three-part series produced by David Schliep of Horizon Battery. After you’re done reading I suggest you sign up for their newsletters and special offers by clicking here. And of course, once you decide to purchase batteries, I highly reccomend Horizon Battery. They have good prices and excellent customer service. First and foremost, everything depends on what you are trying to achieve with rechargeable batteries. How do you plan to use them? More importantly, what are the specifics of your portable electronic devices? Let’s explore some of the common ways to effectively use rechargeable batteries. High drain devices. Wireless microphones, in-ear monitors, flash units, digital cameras, CD and MP3 players and other high-drain devices all work just fine with rechargeable batteries. In fact, rechargeable batteries are preferred because of their faster recovery times between power use (such as a flash unit.) Many times, the overall strength or capacity (known as milli-amp hours or mah) is much higher than a standard alkaline battery. Some other examples of high-drain devices are portable fans, paintball guns and hoppers, and portable TV’s. Know your run-time requirements. To properly choose the right rechargeable system, you will need to know the run-time requirements of your wireless devices. For example, you may need to run a wireless microphone for 2 hours or 12 hours per use. It may be used daily or once a week. A digital camera may be used professionally everyday for 4 – 6 hours or a couple hours twice a month for personal consumption. Another factor — how long does the device sit dormant in stand-by? A video game controller may be used for 2 hours but only once a week. Are your electronics stationary or on-the go? Is it important to be portable when considering a charging unit? Understanding your pattern of usage and run-time requirements will help in choosing the best batteries and minimize frustration. Finally, consider what you are spending a year on throw-away batteries. Is it $50 or $5000? When we switched all the Cirque du Soleil touring and resident shows over to rechargeables, they were spending over $1000 per week in disposable batteries. Talk about saving money! In contrast, a church or school facility may spend upwards of $1000 per year. Even most families spend an average of $150 -$200 per year. That adds up to over $10,000 in a lifetime. Have you ever considered where else you could be spending that 10K instead of throw-away batteries? Your assignment, if you choose to accept it, is to compile a list of all your wireless gear and classify it by low-drain or high-drain and by battery size. Also jot down a note about your usage pattern for each device. You’d be surprised how many batteries you use in your facility or household. Find a helpful chart to download here. Did you make a list of your electronics and the batteries they need? Once you understand the needs and specifics of your wireless electronics, you’ll want to select the right batteries. Here’s some helpful tips in choosing the best battery for each application. High-drain devices. For electronic devices such as wireless mics, in-ear monitors, flash units, portable fans, etc., always use the highest capacity batteries available. Even if your run-time requirements are minimal, high-drain devices are best handled by high-capacity cells. Since Ansmann cells do not have memory effect, it does not matter if you use the device for 2 hours or 12 hours. For AA’s this means choosing Ansmann 2700 mah or 2850 mah cells. Ansmann cells are not only high capacity, but have high recycles. Obviously, you’ll save more money by purchasing a high capacity battery that allows up to 1000 recharges. It makes no sense to skimp on an inferior brand that touts high capacity but can only deliver for 50 recycles. You’re needlessly throwing money -and batteries- away. For AAA’s, use Ansmann 1100 mah cells. For C and D cells, use the Ansmann C 4500 mah and D 10,000 mah cells. For 9V’s you have two options: If your run-time requirements are less than 4 hours,choose the standard Ansmann 250 mah cell. For longer run-times and extremely high-drain 9V devices, utilize the Hi-Tech 9V lithium ion rechargeable cell. These batteries are rated at 600 mah and can achieve run-time applications for over 15 hours depending upon the drain of the device. However, the number of recycles are up to 500 instead of 1000. Remember, the higher the capacity (or mah) the longer the run-time. The high-capacity cells have longer -run-times but do experience self-discharge -about 2% per day. This means if you leave a Ansmann 2850 mah AA battery in a wireless mic for one week, you’ll lose at least 10% of available power just by virtue of self-discharge. High capacity cells need to be left on a quality battery charger on “trickle charge” (we’ll get to that next time) until their next use. So, for devices that are left dormant, in stand-by, we recommend Ansmann Max-E LSD batteries. High recycles are key. Always choose batteries with the highest recycles available. Check the brand reputation. Cirque du Soleil, Blue Man Group and 25,000 schools, churches and theaters all use the Ansmann brand for a reason – they work! Not just 50 times, but up to 1000 times – year after year. Again, the purpose of switching to rechargeables is to save money. The more recycles achievable, the more bang for your buck. Equally important as the correct rechargeable battery is the proper battery charger. You don’t want to ruin great batteries with a bad charger. Let’s take a look at the battery charger options. First, determine if you want to use a universal, high capacity centralized charging unit or several portable units or both. Most avid users of rechargeable batteries wind up using a combination of both. Suppose your facility is a church with 12 AA wireless microphones, four 9V in-ear monitors, 5 listening assistance devices that use AA’s, and 10 LED lamps that use AAA’s. Obviously, this application will require a few high-capacity chargers that can charge multiple types of cells. Perhaps you’re a family of four with a new baby. You need a charger that will handle AA’s for the digital camera and baby monitor, C batteries for the baby swing, AAA’s for the dad’s TV remote and wireless headphones, and a collection of C’ and D’s for the toys and games. It would make more sense to go with a universal charger too, but you may want a small portable charger as well for on-the-go charging. A professional photographer may want an extremely fast AA charger for flash units, but still need portability for on-location. Ansmann offers quality battery chargers for every application. If you still have that “device list” I asked you to create, now’s a good time to add all the batteries up and figure what charger(s) is/are best for you. On our website you’ll find a list of battery chargers, divided to into AA, 9V, and Combo chargers. Depending on how many batteries you need to charge, we can charge as little as two batteries and as many as 16 with a single charging unit. Next, make sure the charger is “intelligent” and automatically switches to “trickle” charge when the batteries are completely charged. This will maintain the batteries in a topped-off condition and prevents over-charging which shortens the battery life and recycles. * The charger should not overheat the batteries. Many chargers on the market today that are dubbed as “fast chargers” overheat the batteries and shorten their life. Ansmann chargers, even the super-speed chargers all have over-heat protection to make sure batteries remain at an optimal temperature while charging. For best results, choose a battery charger that offers refreshing or reconditioning of the cells. 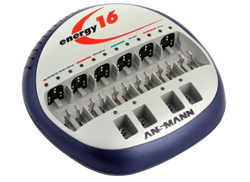 Ansmann Energy 8 and 16 chargers both feature an automatic refresh cycle which keeps the battery chemistry at optimal balance. This assures long run-times and higher recycles then with chargers that do not provide this benefit . And, although Ansmann cells do not have a memory effect, after years of service all nickel metal hydride cells (NiMH) develop chemistry imbalances that need to be corrected for optimal battery life. The refresh function on the Energy 8+ and Energy 16 will maintain your batteries providing you with the greatest battery life. Here’s a little recharging tip: Do not try to run the batteries completely dry. We’ve all been accustomed to squeezing the most out our throw-away alkalines. You do not have to do this with your Ansmann rechargeables. They do not develop memory effect. Whether you use the battery for 2 hours or 12, return it to the charger and get it ready for the next use. Finally, consider extra batteries. Instead of having a huge pile of throw-aways, reduce your extra batteries to a few spares or at most a second set. This is true whether you use standard rechargeables, or LSD cells, or both. Always have a few spares. Isn’t it much more convenient to have a few extra batteries just sitting on the charger instead of scrounging around for a random battery in the junk drawer? To save even more money, consider buying our batteries and chargers in pre-packaged kits. You receive special savings and the assurance of getting the best batteries and chargers available. I hope this series was helpful in selecting and using your rechargeable battery system. From time to time, we’ll send you more tip and tricks as well as new product offerings. Next articleThe economy is so bad…. Can I charge the iPhone8 or iPhoneX with a case on? Thanks so much for the information. That was immensely helpful. At my church we use IEM’s. Cleaned up the sound quite a bit in the house – the IEM’s are a godsend. However, the 9v’s are expensive! Is there a package you would suggest? brand of batteries and charger? we have four IEM’s at a time. Thanks so much! Even though it’s a couple years old this was the best breakdown of rechargeable batteries I’ve seen online. Thanks for the knowledge share. I agree, but it’s now FIVE years old – a long time in politics and even longer in tech terms! Batteries have evolved greatly. Could you update, Mitch – without advertising Ansmann? !